Having relegated the Hop Bomb IPA from its core packaged range, Boatrocker has wasted little time in adding a new IPA to said lineup. In keeping with the times and, indeed, with the brewery's ethos, it comes with a funky twist. Jungle Jive is a sour IPA, a beer that started out being soured in the kettle before being joined by hops down the line – late enough to impart their fruity aromas and flavours without adding bitterness that could clash with the acidity. The result is something of a wolf in sheep's clothing. The aromas from the glistening pale golden beer are predominantly of a soft Wrigley's Juicy Fruit bent, making the bracing acidity that sweeps your palate something of a surprise. Like the first mouthful of a chilli dish, it asks your palate to step up a notch so you can fully appreciate a smooth and full bodied beer with a finish akin to a dry white wine. It's a welcome addition to the small but growing number of hops 'n' acid beers coming out from local brewers – one in which it helps to imagine the souring elements doing the work usually handled by bitterness in an IPA. What's more, taking inspiration from the success of Miss Pinky, the beer is being ranged nationally by Dan's as well as hitting independents. 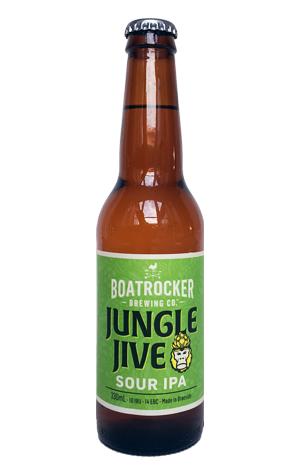 First a raspberry Berliner Weisse, now a sour IPA stocked in a major retailer... the Boatrocking continues apace.